Slater-inspired board. 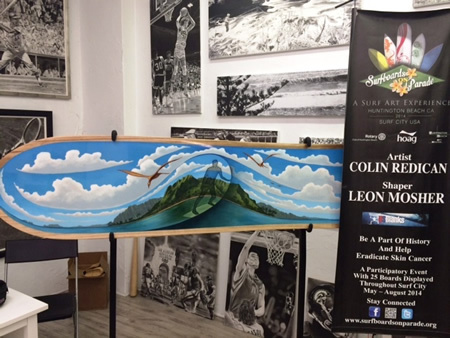 Photo courtesy of Bobby Z.
It’s not often that one sees an entire surfboard embedded in a framed canvas, but sports artist Dave Hobrecht has done just that before drawing and painting the image of legendary surfer Kelly Slater riding roiling waters on the assemblage. “For this project I really wanted a board ridden by Kelly Slater, but I was told repeatedly that Kelly simply did not give away his boards,” said Hobrecht. “And then, I got the board after all,” he explained happily. Even so, the 5 foot 10 inch board shaped by Al Merrick was too small to do his concept justice. Instead, Hobrecht decided to surround the board with canvas and a frame that echoes the board’s curvature. It is meant to be free standing since the wax Slater rubbed on the board’s deck is still visible. Hobrecht’s work is one of 28 surfboards created by locally acclaimed board shapers and fine artists for “Surfboards on Parade,” charity benefit planned in Huntington Beach in October. 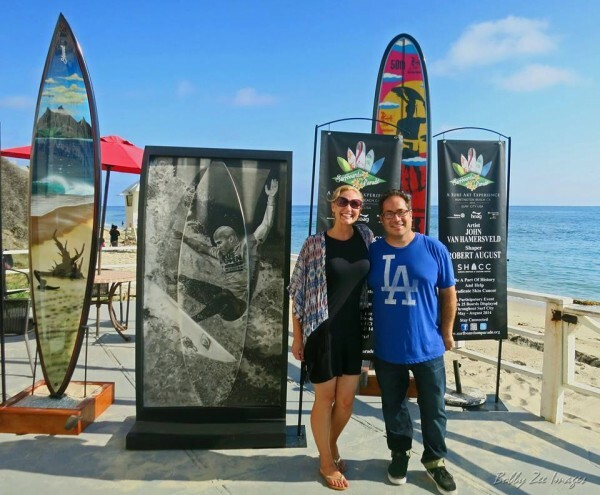 During August’s First Thursday Art Walk, visitors to his Laguna Beach gallery, Hobrecht Sports Art, could admire a few of the charity boards including one by the marine artist Wyland. 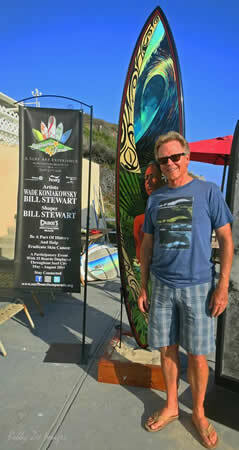 Artist Wade Koniakowsky with the Polynesian theme board he created with well-known shaper Bill Stewart . photo courtesy of bobby Z. Of those present, artists had embellished them with images ranging from legendary surfers to sharks and a replica of an Andy Warhol portrait of Marilyn Monroe. Thereafter, the creations can be viewed at the Shorebreak Hotel, the Hyatt Regency and the Waterfront Beach Resort, which will host the Oct. 11 gala and art auction. Organizers hope that the Wyland board, shaped by Tim Stamps, will fetch $25,000, an average going price. Hobrecht’s board, given its illustrious history, might bring twice as much, promoters suggest. Hoag Hospital, noted for its cancer institute and work with skin cancer patients, is the most prominent beneficiary of the gala, founded by the Rotary Club of Huntington Beach. Others include the Huntington Beach Art Center and the International Surfing Museum. Contributing artists range from Dana Point to Mata Atlantica, Brazil. That’s where artist Ithaka spends half of each year photographing endangered insects. “It is a bio-diverse hotspot where I keep a studio and one that inspires my work,” he said. His brilliant blue moth made from recycled surfboards reflects the seemingly otherworldly creatures he has photographed. His “Lazulius Tinnea” can currently be found at the Main Street Wine Company on Main Street in Huntington. Artists and shapers are donating time, effort and materials. For some, the collaboration pushed them into new territory. For example, artist Wade Koniakowsky, of Carlsbad, teamed up with board shaper Bill Stewart, owner of Stewart Surfboards in San Clemente. They switched their usual roles. “We tossed a coin, and I got mine and Wade got the shaft, meaning I got to paint the deck and Wade got the underside,” quipped Stewart, noting that they became close friends 15 years ago when they swapped a surfboard for a painting. His nine-foot board, replicating those ridden in Hawaii and featuring a lovely wahine surrounded by water and flora, he values at $25,000. Another artist’s work on display inside Hobrecht’s gallery. Photo courtesy of Kevin Ashford. “Painting the board came naturally since I do a lot of figurative art based on Polynesian culture,” explained Koniakowsky. Roy Gonzales delves into the cartoon art subculture in his tribute to Hawaiian surfing legend Montgomery “Buttons” Kaluhiokalani. The Stinger surfboard was created by Duke Aipa and further symbolizes the symbiotic connection between the Hawaii and California surf scene. Gonzales describes the Stinger as a wider, lower gravity board that is easier to maneuver and that inspired the invention of skateboards. “I have donated boards before to charity. It is a great opportunity to reach out into communities, especially kids,” he said.